Sea trials are possible because they have solved the energy problem. Rr5om now on it is an exercise in optimization and improving performance. A hundred mile range and massive kenetic energy will be a ship killer. Better yet eventually the technology will advance to rapid fire as well. This will also be an excellent weapon for our space based gravity ships that are clearly large enough to pack such a system. The power system would also be driving the laser systems. The US military Rail Gun program is expected to start sea trials which has been dubbed the ‘worst nightmare’ of the enemy soon to be deployed. A railgun is an electrically powered electromagnetic projectile launcher based on similar principles to the homopolar motor. A railgun comprises a pair of parallel conducting rails, along which a sliding armature is accelerated by the electromagnetic effects of a current that flows down one rail, into the armature and then back along the other rail. Railguns are being researched as a weapon with a projectile that would use neither explosives nor propellant, but rather rely on electromagnetic forces to achieve a very high kinetic energy. While current kinetic energy penetrators such as an armour-piercing fin-stabilized discarding-sabot can achieve a muzzle velocity on the order of Mach 5, railguns can potentially exceed Mach 10, and thus far exceed conventionally delivered munitions in range and destructive force, with the absence of explosives to store and handle as an additional advantage. In addition to military applications, NASA has proposed to use a railgun from a high-altitude aircraft to fire a small payload into orbit; however, the extreme g-forces involved would necessarily restrict the usage to only the sturdiest of payloads. 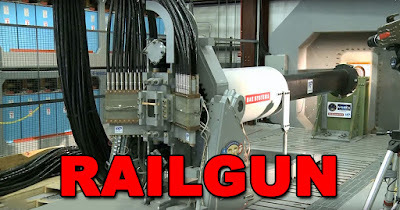 In its simplest (and most commonly used) form, the railgun differs from a traditional electric motor in that no use is made of additional field windings (or permanent magnets). This basic configuration is formed by a single loop of current and thus requires high currents (e.g. of order 106 ampere) to produce sufficient accelerations (and muzzle velocities). A relatively common variant of this configuration is the augmented railgun in which the driving current is channeled through additional pairs of parallel conductors, arranged to increase (“augment”) the magnetic field experienced by the moving armature. These arrangements reduce the current required for a given acceleration. In electric motor terminology, augmented railguns are usually series-wound configurations. The armature may be an integral part of the projectile, but it may also be configured to accelerate a separate, electrically isolated or non-conducting projectile. Solid, metallic sliding conductors are often the preferred form of railgun armature but “plasma” or “hybrid” armatures can also be used. A plasma armature is formed by an arc of ionized gas that is used to push a solid, non-conducting payload in a similar manner to the propellant gas pressure in a conventional gun. A hybrid armature uses a pair of “plasma” contacts to interface a metallic armature to the gun rails. Solid armatures may also “transition” into hybrid armatures, typically after a particular velocity threshold is exceeded. A railgun requires a pulsed, direct current power supply. For potential military applications, railguns are usually of interest because they can achieve much greater muzzle velocities than guns powered by conventional chemical propellants. Increased muzzle velocities can convey the benefits of increased firing ranges while, in terms of target effects, increased terminal velocities can allow the use of kinetic energy rounds as replacements for explosive shells. Therefore, typical military railgun designs aim for muzzle velocities in the range of 2000–3500 m/s with muzzle energies of 5–50 MJ. For comparison, 50MJ is equivalent to the kinetic energy of a school bus weighing 5 metric tons, travelling at 509 km/h (316 mph). For single loop railguns, these mission requirements require launch currents of a few million amperes, so a typical railgun power supply might be designed to deliver a launch current of 5 MA for a few milliseconds. As the magnetic field strengths required for such launches will typically be approximately 10 tesla, most contemporary railgun designs are effectively “air-cored”, i.e. they do not use ferromagnetic materials such as iron to enhance the magnetic flux. It may be noted that railgun velocities generally fall within the range of those achievable by two-stage light-gas guns; however, the latter are generally only considered to be suitable for laboratory use while railguns are judged to offer some potential prospects for development as military weapons.